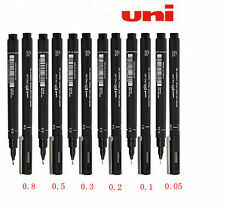 6pcs UNI PIN Fine Line Pen 005 01 02 03 05 08 Needle Point Tubular Drawing Pen. Ink : Black Quantity;6PCS. Southeast Asia. the Middle East and Asia. Technical qualities include an archival quality Pigma ink, its waterproof, fade and chemical resistant. Antique English Practicing Writing Quill/English calligraphy pen. 1 x Dip Pen. Material: solid wood. Also note that monitor settings may vary from computer to computer and may distort actual colors. Good for beginner practicing calligraphy or for mixing colors in painting. Material:ink stick. 1Pc x  Ink Stick Block. Made in traditional tech in all ages, the Ink grind well with bright luster. With slight pleasant ink fragrance. 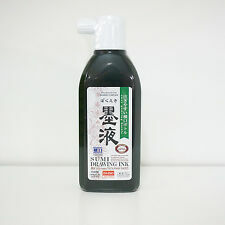 Japanese Chinese Calligraphy Sumi Painting Ink Bokuju 180ml 1 Bottle #473850. Color: Black Sumi. Condition: New, Japan Import. 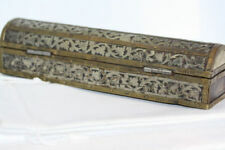 English Copperplate Script Antique Dip Pen Oblique Calligraphy Pen Holder. Quantity: 1Pc ( the nibs of pen are not included ). Item: Holder. 1 x Holder. Color: Black Golden. Due to the difference between different monitors, the picture may not reflect the actual color of the item. 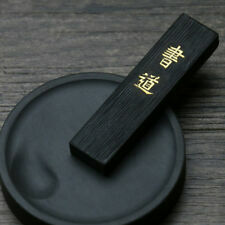 The top of it is supple and flexible you can use it for various uses especially for calligraphy and Manga. Pen Size: 18 x 1.2 cm. Hope a pleasant cooperation! Quantity: 1Pc ( the nibs of pen are not included ). Item: Holder. 1 x Holder. Color: Black Golden. Due to the difference between different monitors, the picture may not reflect the actual color of the item. The pen is made up of a brush head, storage chamber, threaded sleeve, cap composition. In the brush head is internally provided with a uniform distribution of the ink pipe. In the lower part of the brush head is arranged with a vacuum filter plug. 3 x Calligraphy Pens. Also note that monitor settings may vary from computer to computer and may distort actual colors. Well pen form,bring you a comfortable writing experience. High quality printing ink, less fading. 6pcs x Calligraphy Brush. Material of white head brush: wool. Material of brown head brush: weasel's hair. Perfect for Chinese and Japanese calligraphic practice. Length of brush hair: approx.28mm. White head brushes are fit for painting. This comic pen set includes one wooden holder, a bottle of ink and three nibs. 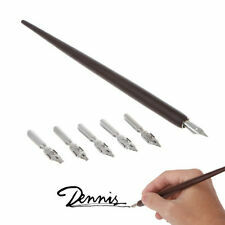 The pen is made of stainless steel nib and solid wooden holder, easy and comfortable to use. Great for comic beginners or calligraphy enthusiasts. Water was usually kept in a ceramic container and sprinkled on the inkstone. Don't use half ground ink.If gray stone is needed, add water to dilute it. Washout any left over ink; using overnight ink will produce inferior tones. Japanese Chinese Calligraphy Rice Paper White 100 Sheets #41. Contain: 100 Sheets (White). Condition: New, Japan Import. White clouds Wolf's hair Brush pen middle school students calligraphy practice brush. Item type: Writing brush. 2 Middle writing brush(White Brown). 2 Big writing brush(White Brown). 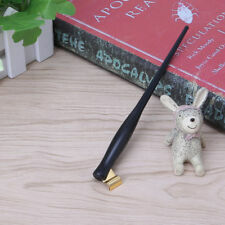 2 Small writing brush(White Brown). Well pen form, bring you a comfortable writing experience. Suitable for calligraphy, signature, nominations painting, copying by the book, sketch lines. Easy to write. Color: as shown in picture. USA, Canada, United Kingdom, Austrilia, France, Germany, Spain, Ireland, Italy, Others. Brown head brush : made from weasel's hair, fit for writing. White head brush : made from wool, fit for painting. you will get 3 brown brush. T hank you. Hope a pleasant cooperation. P lease double check before finalizing the checkout process. We appreciate your understanding in this matter. Colors : 12 Colors. Fude (brush). Suzuri (inkstone) and Sumi (black ink). Hanshi (calligraphy paper). Brush Type:Bold x1,Fine x1. Hanshi is commonly made of washi (Japanese hand-molded paper). The hanshi is placed on top of a pad that's usually made of soft cloth. 5x Golden Nib Calligraphy Fountain Pens 5-Pen Set 5 Nib Sizes 0,1,2,3 & 4. 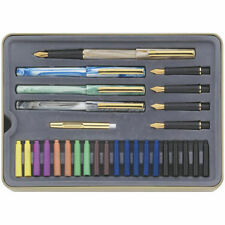 Quantity : Total 5 Golden Nib Calligraphy Fountain Ink Pens (set as in Image). Camlin is Trusted for Quality Fountain Pens. Colour: Red,Black, Green,Blue and Pigeon Grey ( One Pens Of Each Colour). 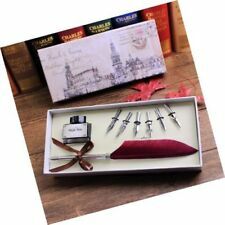 THE MASTERCLASS CALLIGRAPHY SET. 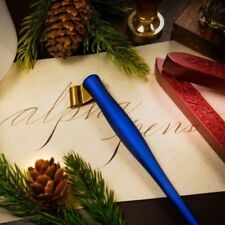 THE MANUSCRIPT MASTERCLASS CALLIGRAPHY SET HAS BEEN CREATED SPECIALLY FOR ANYONE EAGER TO PRACTICE THE ART OF CALLIGRAPHY. 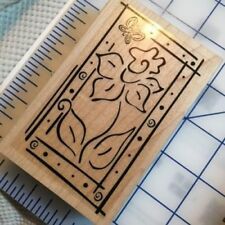 THE DETAILED INSTRUCTIONS AND QUALITY TOOLING INCLUDED IN THIS KIT PROVIDE ALL THE NECESSARY MATERIALS FOR THE CALLIGRAPHER TO LEARN EASILY AND QUICKLY. This tin of red ink is suitable for calligraphy, painting, stamping and seals. No need to stir, and no residule deposit left in the seal. The print dries very fast compared to traditional ink paste and does not bleed on rice paper. 4 X GENUINE GOLD PLATED NIBS IN. 5pcs x Nib. 1pc x Dip Pen. Material: solid wood. USA, Canada, United Kingdom, Austrilia, France, Germany, Spain, Ireland, Italy, Others. Canada, United Kingdom, Austrilia, France, Germany, Spain, Ireland, Italy, Others. The water-based dye ink flows smoothly and is available in a wide range of bright colors. This pen is a unique addition to any artist's box! But it may delay due to Custom / Weather. We will hand select the best box condition out of our inventories. Kuretake No. 8 Fountain Sumi Brush Pen. Fude pen Mannen Mouhitsu Takujo (also known as Kuretake Brush pen No.8 - Brush tip) is a brush tip with a long body that is easy to write as well as draw with. This set includes a Fountain Pen and two pens with a Ballpoint or Rollerball Pen ( I am not sure the difference). The pen you push down has ink in it and the other two are dry. Pen Set of 3 Made in Italy. 3pcs x Water Brush Pen. Water brush: Nylon brush tip with refillable reservoir. Pen head material: fiber hair. Small pen size: hair length: 1.4cm, total length: approx. Large pen size: hair lenth: 1.7cm, total length: approx. 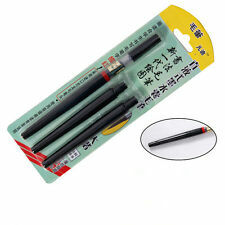 6xChinese Japanese Water Ink Painting Writing Calligraphy Brush Pen Set Art Tool. Tip material: Wolf's hair/sheep's hair. Item type: Writing brush. 2 Big writing brush(White Brown). 2 Middle writing brush(White Brown). White Clouds Wolf's Hair Pen Middle School Students Calligraphy Practice Brush. Tip material: Wolf's hair/sheep's hair. Item type: Writing brush. 2 Big writing brush(White Brown). 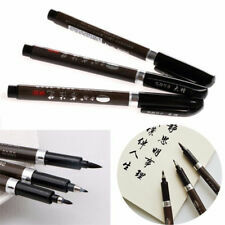 2 Middle writing brush(White Brown).